Condition: 8.5/10. Item is in excellent condition. Comes with original box. With technology plucked from Nordost's reference cables, each Norse Bi-Wire Jumper features a micro mono-filament conductor and high-quality low mass terminations. Designed to complement Nordost's Norse line, the Norse Bi-Wire Jumpers offer astounding clarity, excellent dynamic range and are extremely flexible. 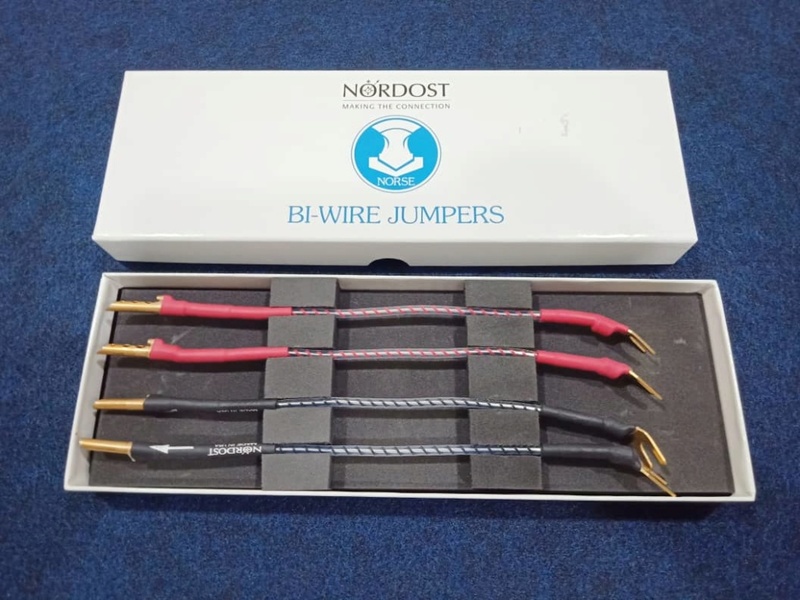 Nordost Norse Bi-Wire Jumpers are designed to be easy to use, built with spades on the send side and bananas at the receive end, the Bi-Wire Jumpers are ideal for use with any bi-wirable or tri-wirable speaker. One set of Bi-Wire Jumpers upgrades one pair of bi-wirable speakers. Tri-Wiring? You'll need two sets. For those looking for maximum performance from their bi-wire speakers, Nordost has a recommendation. Connect your speaker wire to the speaker as follows: Red lead to the Red midrange/bass post, Black lead to the Black tweeter post. Then insert the Norse Jumpers as you normally would, sit back and hold on to your socks. The effect is astounding, with greater focus, detail and less haze and grain. We don't really understand how it works, but it does so try it for yourself!